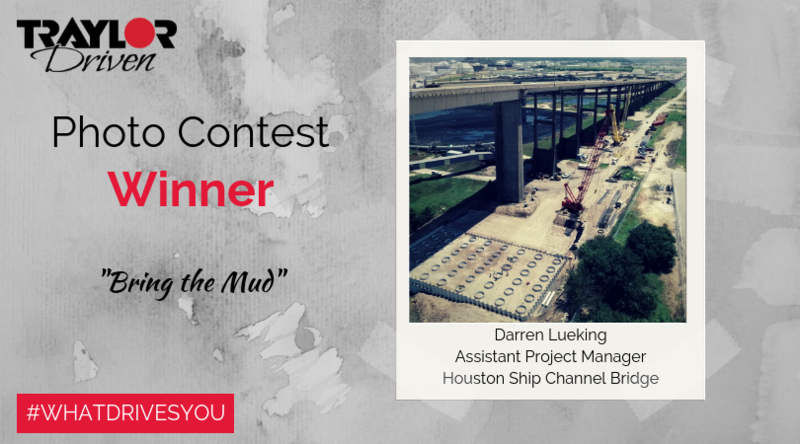 Traylor Driven Photo Contest Winner: "Bring the Mud" - Traylor Bros., Inc.
Our final Traylor Driven contest of the year’s winner is an image titled “Bring the Mud,” submitted by Darren Lueking, Assistant Project Manager at our Houston Ship Channel Bridge project. TBI: Briefly describe the photo and how you happened to capture it. Darren Lueking (DL): We had just finished the cofferdam a few days before and had placed the void pipes for the future drilled shaft locations. I had Ship Channel Constructors Substructures Superintendent Anthony “AJ” Nanfro fly the drone, which we do every few months to track progress. [Regular drone use is becoming a best practice for recording project progress.] It just so happened that this was the last sunny day for almost three months! There has been mud everywhere, making work very difficult. 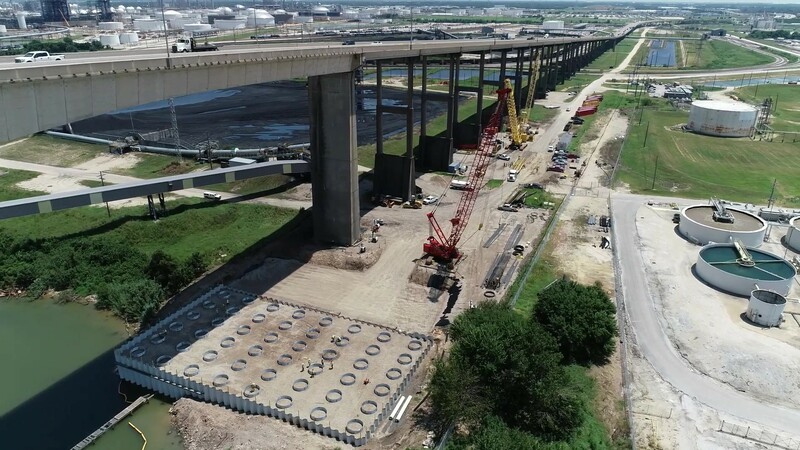 This image is of the South Main Pylon just prior to us capping the top of the cofferdam with two feet of concrete to make a working pad for our drilled shaft subcontractor. The cofferdam was installed by Traylor superintendents Mike Irish and Ed Zalot, along with foreman Humberto Lanuza. TBI: Tell us about your role on HSC and what you enjoy about it. DL: My role at HSC is as the Assistant Project Manager. My job is to try to get things get done, and to hopefully make some money. TBI: Is photography a hobby of yours? What else do you enjoy doing when you’re not working? DL: Photography is not hobby of mine. My main hobby is biking. I just completed a two-day, 180-mile ride around the Galveston Bay. TBI: You’re clearly a motivated person. What drives you? At Traylor Bros., we respect all people on a personal and professional level. We express this respect by providing a safe work environment, encouraging work/life balance, offering competitive compensation, and fostering the entrepreneurial spirit of every team member. We have pride in our company and the work we do. We pursue the most exciting work, tackle every challenge as a team, and celebrate both company and individual success. Traylor is Driven by Respect and Pride.